Provide a snow retention system on all specified roof locations consisting of cast aluminum pad style snow guards. System shall be adhesively fastened to the roof. Coordinate the work with the installation of the metal roofing system. Provide necessary adhesives sealant compatible with roofing material and intended for outdoor rooftop conditions. Durable adhesive such as DuraSil by Chemlink. Snow guards locations shall be in accordance with manufacturer’s recommendations. A minimum of two rows, spaced as recommended shall be installed. A. Submit manufacturer’s specification, cut sheets and installation instructions. A. Engage the services of an installer experienced in the installation of metal roofing and snow retention systems. A. Cast Aluminum Ice-Brake Model SG1 (large) or SG2 (small) manufactured from 319 Alloy Aluminum. B. Roof adhesive compatible with roofing material. A. Comply with architectural drawings for locations of snow guards. C. Roof surface shall be properly cleaned prior to application of adhesives. D. Weather and temperature shall be taken into account when installing adhesives to ensure proper set-up of adhesive compounds. * Consult licensed architects, engineers or building officials to judge structural integrity and load capacity before installing IceBrakes. East Coast Roof Specialties and East Coast Lightning Equipment, Inc. are not responsible for determining these factors. East Coast Roof Specialties is a Division of East Coast Lightning Equipment, Inc. For over twenty years, ECLE has been a leading manufacturer of roof-top specialty equipment. 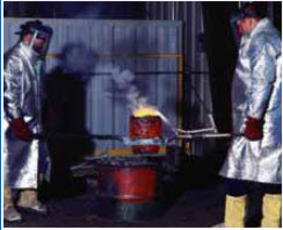 Our production facility, located in Winsted, Connecticut includes a state-of-the-art non-ferrous foundry and wide array of metal working equipment. In addition to snow guards, we manufacturer a complete line of lightning protection equipment including conductors, air terminals, connectors, bases, fittings and grounding products. We also manufacture a line of beautiful cast aluminum and bronze decorative roof-top finials and spires. Our extensive production capacity enables our skilled staff to provide lightning fast service and high quality products. Nearly all of the orders we receive are filled the very same day. Our business has been built by responding to the needs of our customers. We are always available to assist with design, application and installation questions. A Division of East Coast Lightning Equipment, Inc.